Join us for the A.J. 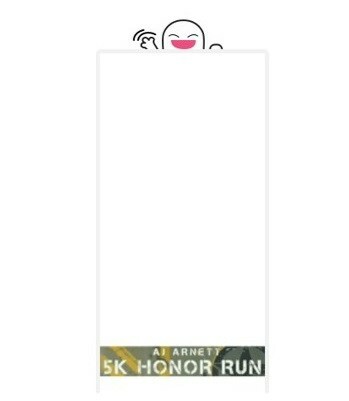 Arnett 5K Honor Run on May 25, 2019 at the Concordia Lutheran High School. 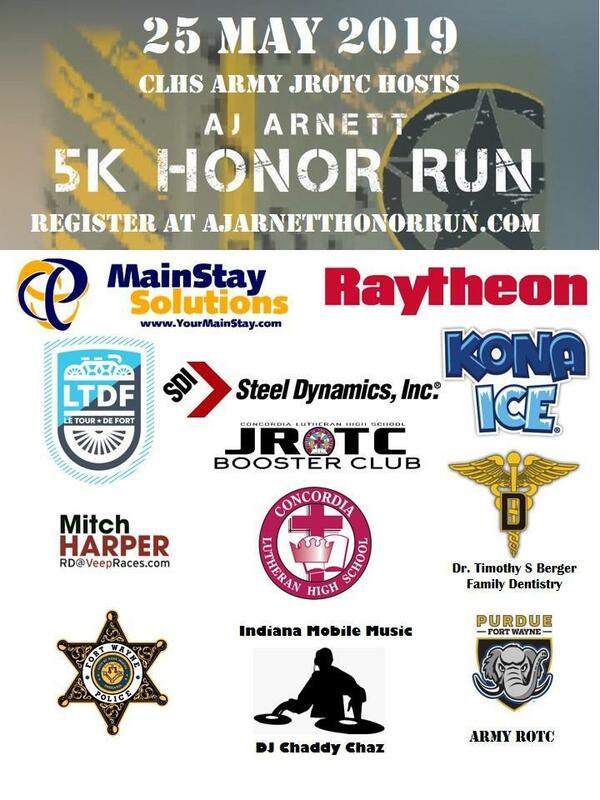 The run is organized by JROTC students and will benefit Honor Flight of Northeast Indiana and Shepherd's House Fort Wayne. 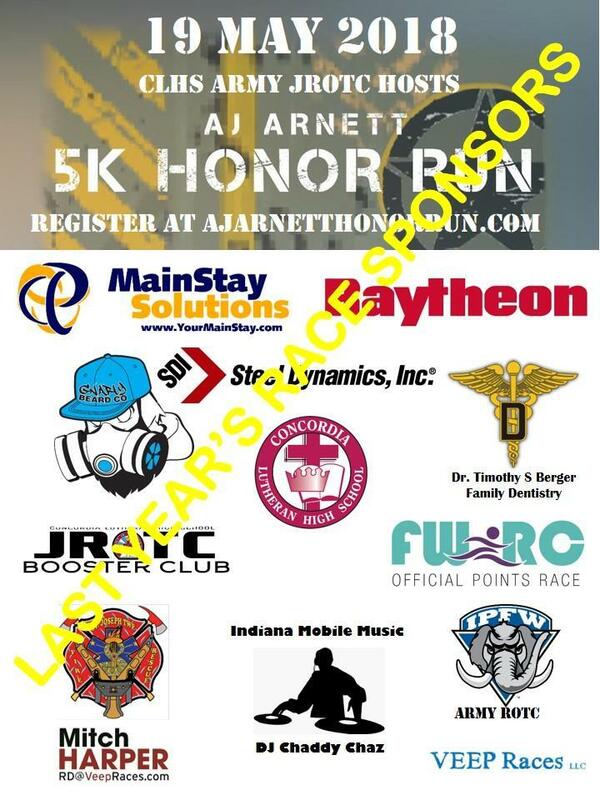 When: May 25, 2019 (Memorial Day Weekend) - 8:30 a.m.
Where: Concordia Lutheran High School, 1601 St. Joe River Drive, Fort Wayne, Indiana 46805. 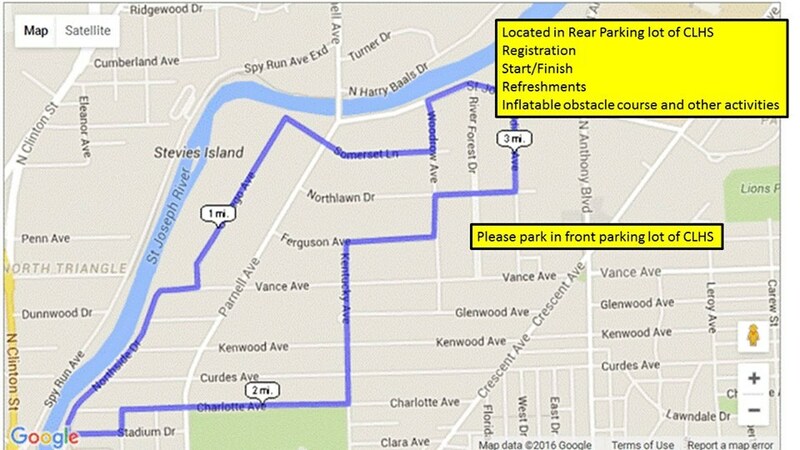 Starts at the high school and then the race goes into local neighborhoods. Cost: Early Bird registration: $23.00 Registration (through 3/31 at 11:59 PM EDT) $28.00 registration, $3 military discount, FWRC discount and family discount (3/31 at 11:59 PM EDT through 5/17 at 11:59 PM EDT) There will also be ’MORNING OF’ REGISTRATION starting at approximately 7:15 am at the CLHS campus. NEW for 2019: Early packet pick-up TBD. Are you in K-8th grade? RUN FREE!! Free registration for K-8th here﻿. 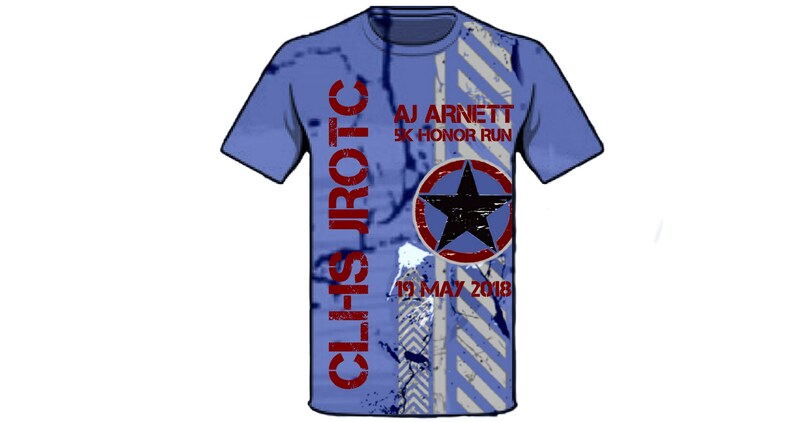 The AJ Arnett 5K Honor Run will be held on Saturday May 25th, 2019. The race starts and finishes at Concordia Lutheran High School. Over the last 4 years we have been able to donate over $32,000 to Honor Flights of Northeast Indiana and Shepherd’s House. Our goal is to raise even more for our worthy Veterans then we did last year. 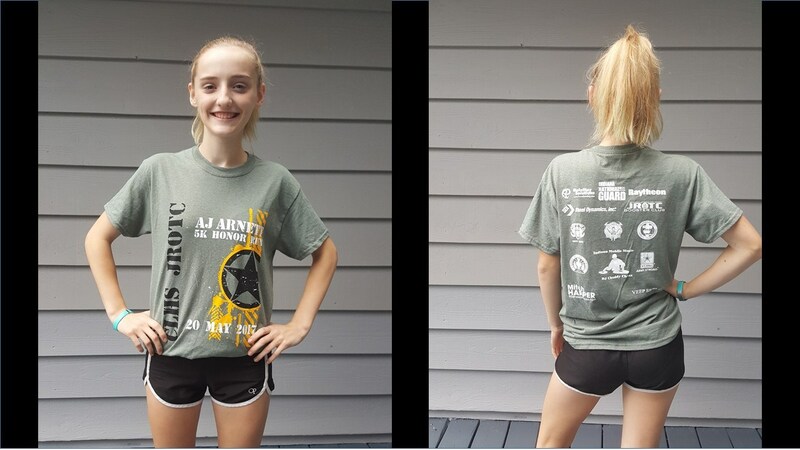 SPC A.J. 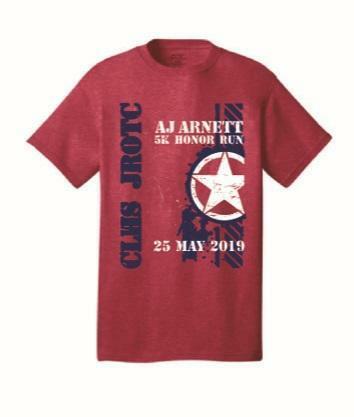 Arnett, a 2004 Concordia Lutheran High School graduate, was the 2003 CLHS JROTC Battalion Color Guard Commander and the Commander of Snap Squad and Adventure Training Teams. He also was a member of the 2004 All SAC Track Team during his senior year. A.J. entered the U.S. Army in June of 2004, leaving the day after graduation. He received his initial training at Fort Benning, Georgia as an Infantryman. A.J. was subsequently assigned to 3rd Infantry Division, Fort Stewart, Georgia, after completing Basic and Advanced Infantry School. A.J. deployed to Iraq with the 3rd Infantry Division in January 2005. On July 13, while on patrol in Baghdad, A.J. was seriously wounded in a car bomb attack that resulted in the death of one soldier and seriously wounding another soldier in his squad. Suffering shrapnel and blast wounds to his leg, A.J. underwent multiple surgeries to repair the extensive damage to his leg. 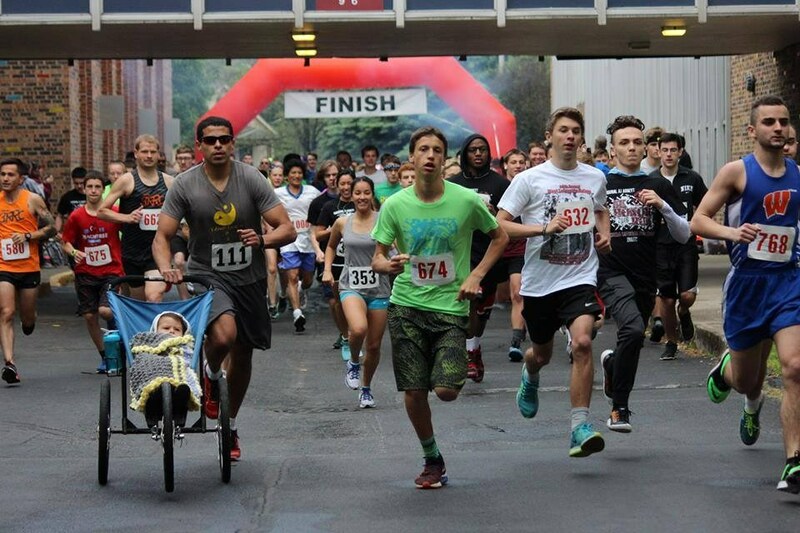 At one point, he was told that he would never run again, but A.J. persevered and continues to run multiple long distance events. A.J.’s awards and decorations include the Purple Heart, Army Commendation Medal, Global War on Terrorism Service Medal, Global War on Terrorism Expeditionary Medal, National Defense Service Medal, Iraqi Campaign Medal, Army Service Ribbon, Overseas Service Ribbon, and Combat Infantry.